Dimensions 0.25 by 7 by 10 in. 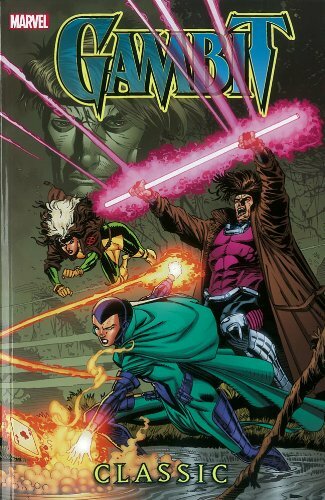 Amazon.com description: Product Description: Gambit and Rogue return to the Big Easy! The Assassins' Guild, now led by Gambit's embittered ex-wife Bella Donna, has kidnapped Cody Robbins - Rogue's first crush, who has been comatose since the two first kissed years before. Can the X-Men's most unpredictable couple track down and rescue Cody in time? And will their tenuous relationship be shattered by Bella Donna's jealous rage? Then: separated from the X-Men, Gambit's heist of a religious artifact is interrupted when he comes to the aid of a beautiful fallen angel. But he's not the only one interested in her...can Gambit overcome the demonic powers of Oliver Stoker and his evil horde, and get the angel Anielle to safe haven?